Laughing Dog opened in November 2009 as an Art Gallery and Gift Shop. Since adding a café into the space in 2011, Laughing Dog’s unique creative mixed space has been a popular destination for Locals and Visitors alike. Grey Walls Gallery is home to many local as well as internationally renowned artists. The Art Gallery has many changing exhibitions. Click here to see our website. Laughing Dog also boast a fine art bespoke printing service to both artists and businesses. If you would like to know more, please Contact us directly. The Lifestyle Store/Gift Shop has an array of items from Local Makers as well as unique offerings from established companies. Most of the items in our shop cannot be found for miles around. The Café won its first award in 2018 for Brighton’s Best Dog Friendly Venue. The Café sources ingredients from an array of local farms and suppliers. Our coffee is roasted in Brighton. Our head baker Ella has been with us for over two years. She brought with her some fantastic recipes, a huge passion for all things food and a heck load of charm. Below, we ask her some questions so people can know more about the gal behind the bakes. Hey Ella! So, how long have you been working at Laughing Dog? Hello! I started working at Laughing Dog as a barista in Autumn 2016 and became the baker towards the end of that year. I love how independently I can create my daily work load and how I’m encouraged to let my creativity run loose. Everyone here is a joy to work with! This makes me look forward to going to work. Some of your recipes are becoming semi-famous. What is your favourite thing to make at Laughing Dog? What I really like doing is coming up with new ideas and adapting recipes. I like that everyday is different and depending on the day I can choose what’s going to be on display for our customers. Of all the things that I make, I’d say my favourite is the Chocolate Orange cake, just because I love to drizzle the melted chocolate! What is your favourite thing to eat here? For my own lunch, I usually make up a healthy salad using ingredients at my disposal! Of the things we serve, I’d say our new Savoury Muffins. 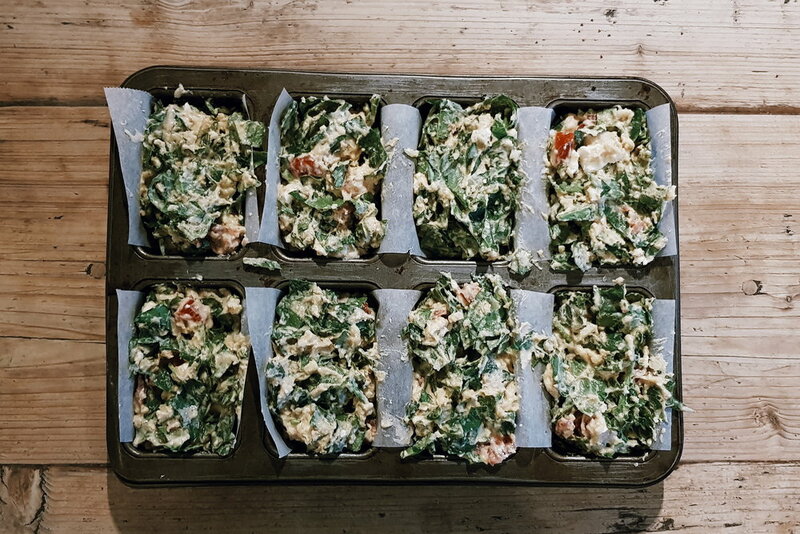 They are full of spinach, feta, pumpkin seeds and chilli. They are healthy and fun with a bit of a kick! We serve it with Sriracha Chilli Sauce. Delicious! Your lemon drizzle is super popular here. Can you tell us about that? I’m from Switzerland. When I was little my mother would make lemon drizzle cake with me and my sister ‘helping’ her. Just smelling the lemon zest brings back very fond memories. It always reminds me of home, So needless to say it was the first thing I started making regularly at Laughing Dog when I became their baker. That’s so sweet! You seem to be constantly evolving the offerings at Laughing Dog. What are you planning for the future? We’re looking to keep things fresh and different so our regular customers have some variety . Lately I’ve been researching more savoury bakes like our savoury muffins, different quiche fillings and filled puff pastry. Christmas is approaching us fast so there will definitely be some festive baking! Do you have a favourite place to eat out in the Brighton area? Other than Laughing Dog of course! I wouldn’t say I have a favourite restaurant or cuisine. I like to go out and try different places. There are so many amazing looking places in Brighton and Hove so we’re spoiled for choice! If I had to pick a place, I would say the food at Street Diner, It’s a street food market in the garden on the corner of Queens Road and Church Street. They have a range of different foods so every time I go there I can try something new! I hear you recently got married! Did you bake your own wedding cake? No I didn’t! (chuckles) As a matter of fact there was no wedding cake. We just had a small cake-less gathering. All very low-key. We accumulated a few interesting recipe books over the years so I like to sit down and ponder through them. I look stuff up online as well, but it’s more fun to go out into town and see what all the other coffee shops are up to. What originally got you in to baking? This is my first baking job! When I was young, my Mother would always bake from scratch and make home made birthday cakes. It’s always been a passion from that point, so as soon as the position came up, I knew I wanted it! Thanks so much Ella! We all wish you well on your baking endeavours at Laughing Dog! All of our milk is fresh and delivered directly from local farms.